From the start of 1985 I was based in St Just near Penzance in western Cornwall. My motivation for moving here from the south-east of England, was inspired by the landscape, the wild jagged line separating sea and land, and the Bronze Age remains of stone circles and standing stones. Shortly after arriving, I set up a small 4-track studio, with the intention of exploring and developing my own style, with no other motive than to create a record of my journey away from conventional music. In the early months I was often visited by David Bickley (by then based in London) and we attempted to express the stunning landscape and history that surrounded this place. 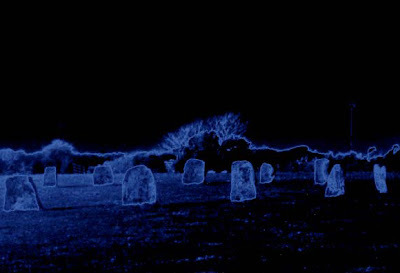 One of the major events that influenced my move to west Cornwall, was a night spent at the Merry Maidens stone circle near Lamorna, where David and I both observed the stones doing a repeated 'dance'. This was on the night of 13-14 September 1984. We were both amazed. Without commenting on what we saw, we alternately asked each other to describe what we were seeing. The outline of the stone circle appeared to be shimmering and vibrating - each pair of stones would, over a period of several seconds, lean towards each other, to an angle of 45 degrees, return to upright, and then lean away, towards the other stone next to it. This sequence repeated many times and the cycle ended by each stone stopping in the upright position and then rotating through 180 degrees. I am pretty convinced that the stones, seen in moonlight, were not actually moving (!) but suspect the apparent motions could have been caused by an aura or energy field surrounding the stones, that was oscillating to some natural rhythmic pattern. We were spellbound. One of the pieces I recorded, inspired by that night, was titled The Stone Dance (Dans Maen).